There is a new breed of online ads out there, and they are gaining in popularity and usage. Ambient Point of Action advertisments (APA) cover the entire Web page where a user is set to accomplish a specific task - such as logging into a website or conducting a search. But unlike an interstitial ad where the user must wait for a transition or close the ad manually, APA ads rest in the background during the task at hand, then disappear when the task is finished. They are interactive without being intrusive, and they are exclusive; not sharing screen space with any other advertisement. Ambient Point of Action ads are often found on login pages and search pages but can reasonably be implemented on any page where a temporary interaction is required. One of the more prominent examples of an APA ad can be found on Yahoo's email login page. The screen space required for the login process is minimal, leaving the entire rest of the screen for the ad - previously vacant real estate. Unlike flashing banners, rotating images or ads that expand across the page while preventing the user from accomplishing a task, APA ads allow the user to immediately interact with the website. In fact, ambient ads can actually enhance a page's design, if done properly. Imagine that ... an advertisement actually improving the user experience. A good example of this can be seen at Grooveshark.com, a streaming music website (pictured). Here, an ad for the Bose SoundDock system is presented when a user first arrives at the website. The ad is relevant, considering the user came to the site for music, unobtrusive and actually quite pleasant. And notice where the product is placed - right where the user will first interact with the website. The advertiser gets a relevant impression that is impossible to miss while the user gets a pleasant experience. Or, at the very least, the user is not obstructed from accomplishing his goal. 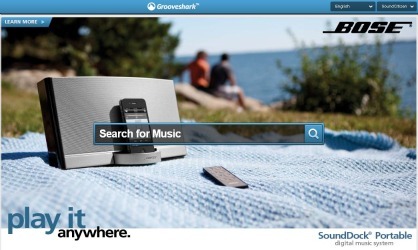 Below the Grooveshark ad is an APA ad for the Samsung Galaxy tablet on the Yahoo mail sign-in page. This one goes even further, allowing the user to play a video within the ad. These ads are an excellent use of space for website owners and can provide an advertiser with a type of run-of-site advertising without the hefty price tag. Online advertisers are always looking for new ways to make an impression on consumers. Ambient Point of Action ads are doing just that.